A fierce rivalry is a great source of entertainment. In the art world, when artists espouse the merits of one style over another, the debate can quickly descend into vitriol, jealousy and animus. In the underground world of street art, one artistic debate is between the styles of graffiti vs. stencils, and each showcases a unique method of expression. When you think of graffiti you think spray paint, tags and murals, but stenciling is slightly different in that it involves cardboard cutouts that are easily transferred onto a surface using paint. In London this medium is personified by Banksy, an anonymous guerilla artist who uses stencils to provide unsolicited commentary on political, cultural and economic phenomena. Part of his allure resides in his mythical status and his skill for making statements in both alarming and satirical ways. 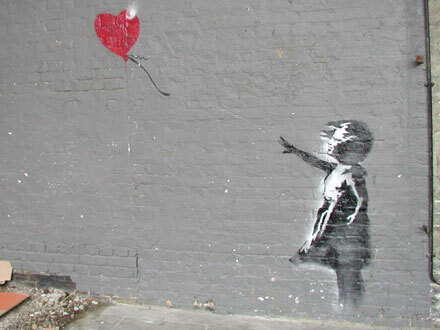 I recently visited London and my secret wish was to happen upon an elusive Banksy. While record shopping in Soho I struck up a conversation with an employee and a shopper about the artist and they recounted a recent controversy between Banksy and his rival, a graffiti artist named Robbo. 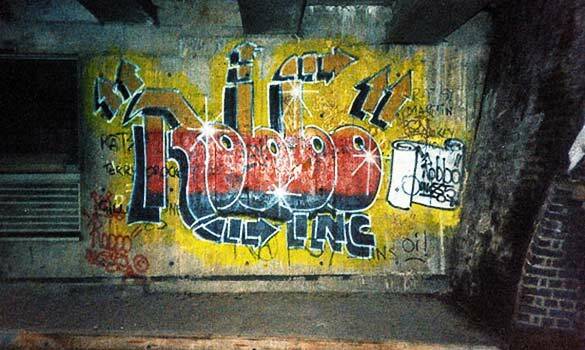 The story goes like this: Robbo has a piece of work under a bridge near Regent’s canal that had remained unscathed for over 25 years, consequently the piece is legendary. In December 2009, Banksy painted over Robbo’s work. The piece features a maintenance worker painting over the Robbo’s graffiti symbolically erasing the image of the man behind the spray can. King Robbo was not amused. 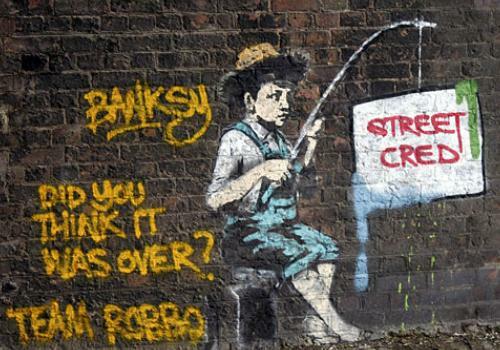 Not to be outone, Robbo got the last word when he tagged over Banksy’s makeover in a self-aggrandizing manner. Irony is a bitter pill. Notice how Banksy’s painter is now painting the praises of King Robbo. If you think this reads like an urban soap opera, just wait, it gets better. Evidently the salvo that instigated this artistic warfare goes back to a brief encounter between the two artists at a party. 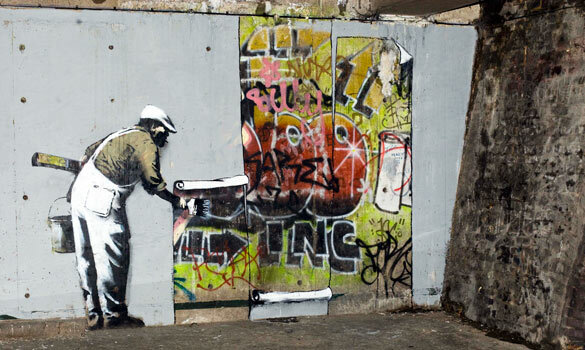 Someone introduced Robbo to Banksy, but he couldn’t be bothered. 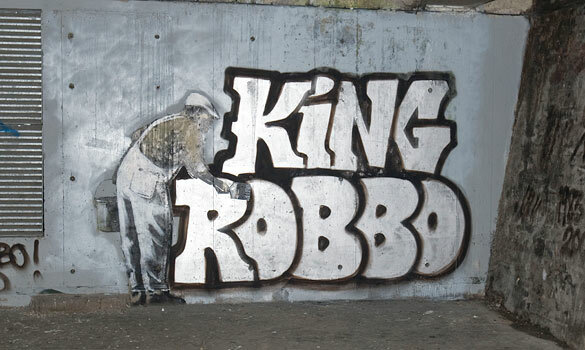 Banksy feigned ignorance of Robbo’s work by saying, “ never heard of you”. Robbo, channeling the dramatic stylings of Alexis Carrington straight out of Dynasty, reached back with his hand, slapped Banksy across the face and said, “You may not of heard of me, but you will never forget me!”. This is the stuff that legendary feuds are made of. Flash forward to today: the controversy lives on through supporters of one camp over the other. “Team Robbo”, a band of vigilante artists avenging the original Robbo makeover, is systematically taking jabs at Banksy through tagging his work all over London. The traces of the punches are left in the works. Many speculate that this rivalry was a brilliant P.R. move which catapulted both artists further into the mainstream. I think there’s some truth to it, after all, any publicity is good publicity. Hearing that story in Soho was better than any Banksy I could ever hope to see, but all of this makes me wonder if underground artists like Bansky, Robbo, Shepard Fairey and their contemporaries like Doze Green and Blek Le Rat experienced an existential crisis when their works became popular. When you’re taking a chance with something risky (and illegal), being unknown can be a protective shield, but once you get a taste for fame (or infamy), anonymity can be a prison. When dealing in a medium as controversial as street art where there’s no permanence to your work, the temptation to generate publicity in other ways is quite compelling. In what ways? This spring, Banksy makes his filmmaking debut in a feature length documentary called, “Exit Through the Gift Shop” (look for the Shepard Fairey cameos). I cannot wait to see this film, and I hope that it sheds some more light on the various styles within this subculture. As much as I am fascinated by this genre, in the interest of artistic diversity, I will step out of the streets and into some galleries. Next up, a trip to London’s Tate Modern. Like Banksy, I’m unimpressed with Robbo’s work. Aside from lacking any relevant content, the style and execution are unremarkable. Hey Reg, thanks for commenting. I think the styles of Banksy and Robbo are so different, but I think the rivalry (real or rumored) makes for some brilliant PR! Thanks for checking it out Christian!